In the sixth episode of the Mindfulness & Grief Podcast, Claudia Coenen, Fellow in Thanatology, Certified Grief Counselor, and author of Shattered by Grief: Picking Up The Pieces to Become Whole Again, shares how creativity and the principle of karuna can help us transform what has happened to us into compassion and connectivity. Learn more about Claudia and The Karuna Project at https://www.thekarunaproject.com. How can life events help us transform into better, more compassionate and connected humans? How can we approach each day, each relationship, with awareness and love? When her husband died unexpectedly while they were on vacation together, Claudia Coenen felt as though she was hovering above herself, thinking, "Your life has radically changed, now what?" She tried many things - journaling, poetry, crafts, dancing and moving meditation - and eventually landed in a graduate grief counseling program. From there she launched The Karuna Project, which offers counseling, workshops, articles and other resources for grief, loss and transition. The word karuna means compassion, but it also means an active compassion. Karuna is a word that was dear to her husband, Alby Coenen, as he wrote it on top of all his letters. Claudia weaves the essence of karuna into her work, encouraging us to be gentle with ourselves in the midst of great pain. Compassion, coupled with creative practices, can help us reorder our shattered world, and make space for the "what now." I always go to creative process in order to pull myself out and sort of figure it out, whats happening inside me, reframe it and work through it. As she used her innate creativity to navigate her own grief experience, Claudia wondered if it could help others. 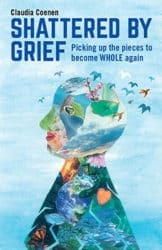 In the sixth episode of the Mindfulness & Grief Podcast, Claudia, explores this approach, and offers wisdom from her new book, Shattered by Grief: Picking Up the Pieces to Become WHOLE Again, and the Karuna Cards deck, which contains 52 prompts to help you cope with grief and difficult life transitions using writing, creative exercises, and meditation. 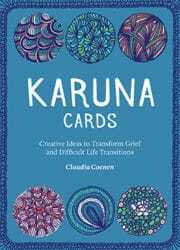 Listeners will get to hear a few of the prompts from the Karuna Cards, and may wish to take some time after the podcast to try them out. Claudia is a Fellow in Thanatology, Certified Grief Counselor, and offers private sessions online and in Hudson, NY.